Indulge in open-air entertainment with stunning views. 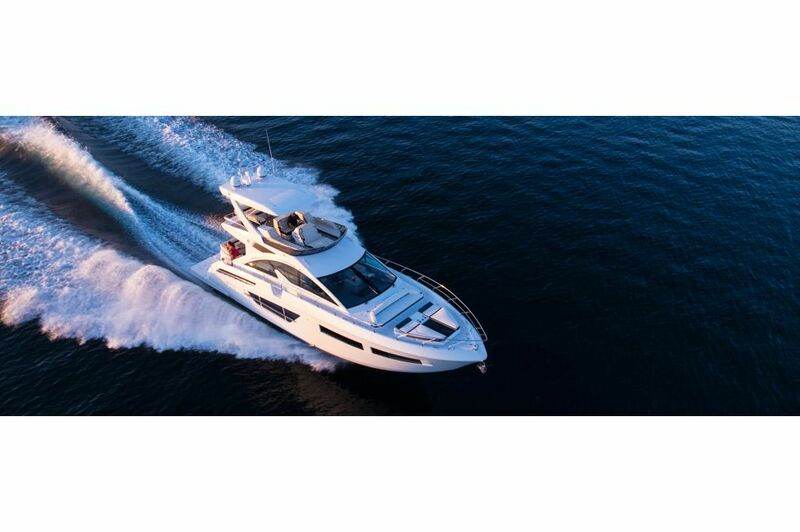 The flybridge to the 60 Fly's options for socializing, and offers exceptional piloting for extended functionality. 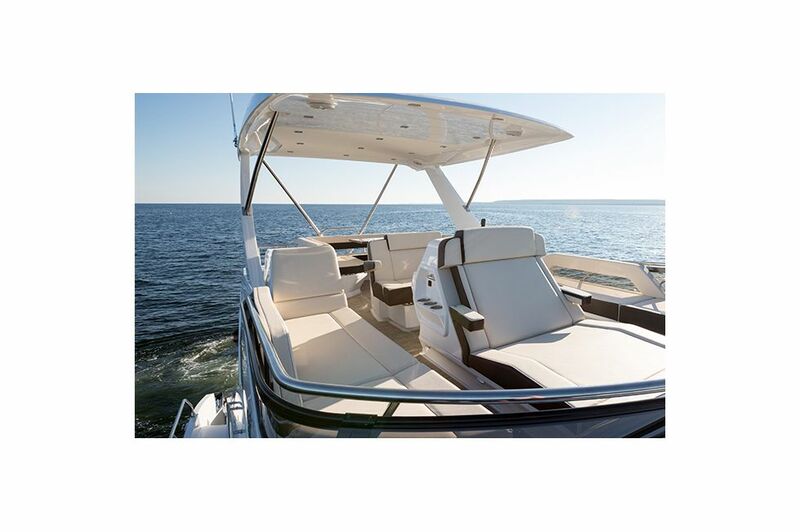 Covered with a hard top for shade and protection from the elements, it's the perfect space for relaxing with family and friends. 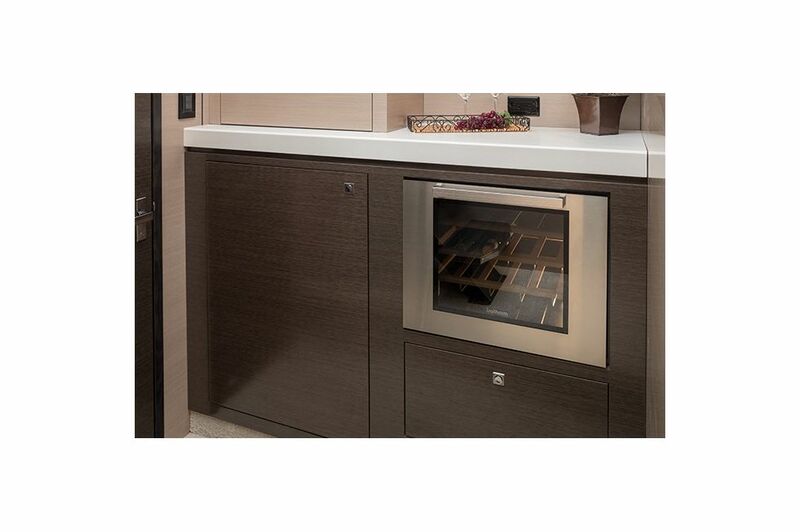 A built-in grill and wet bar add the finishing touches for an extraordinary experience. 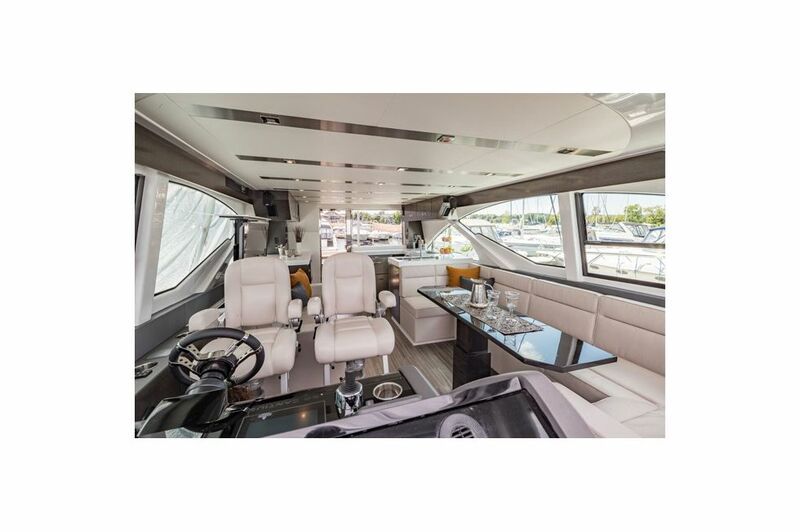 The spacious open cockpit of the 60 Fly is truly mingle worthy. 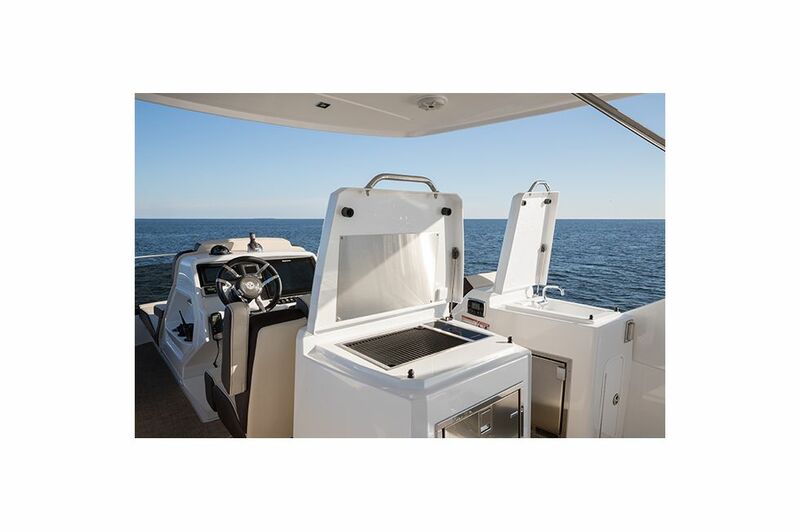 The U-shaped dinette is the perfect way to extend your entertaining options, and the galley is equipped with every luxury amenity you can ask for on the water, including microwave, convection oven, wine steward, bottle storage, ice maker, dishwasher, and more. 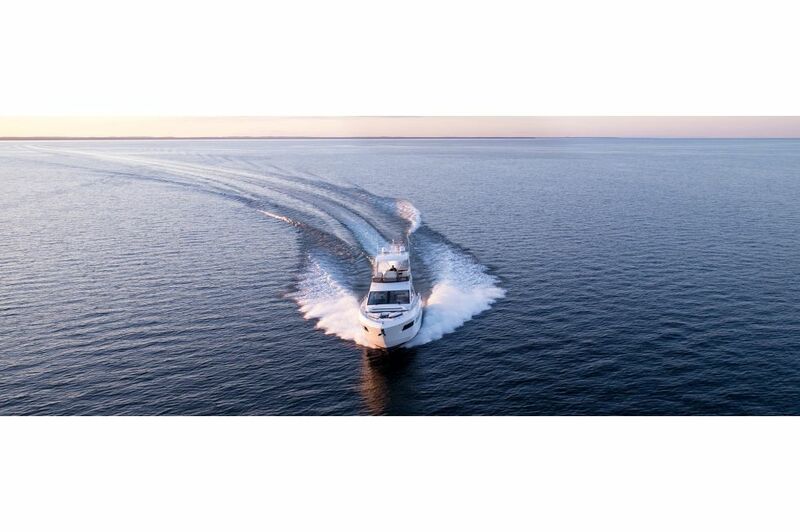 Navigate and plot your course in comfort. 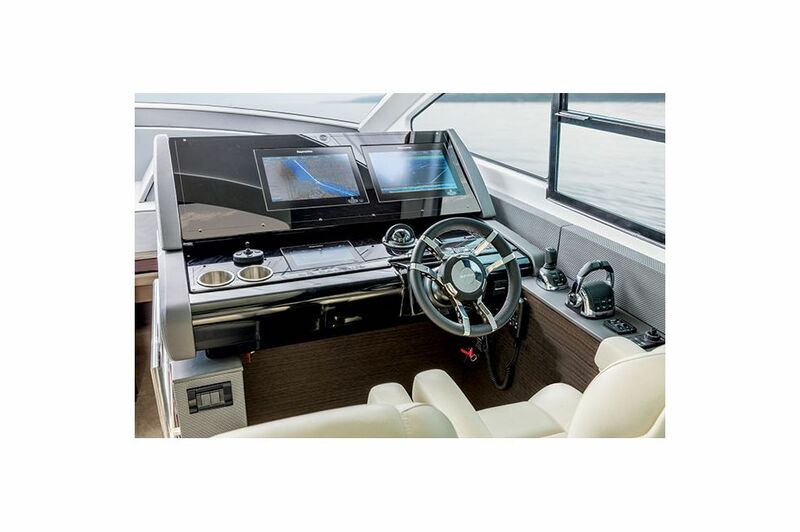 The helm has an ultra-lavish captain's chair with companion seat, as well as innovative, state-of-the-art digital screens and piloting instruments, giving you an unhindered view for the trip ahead. Set your sights on the horizon. Surrounded by windows, the salon offers you and your guests enchanting water-level views while enjoying a meal in the spacious dining area. Dine in style at the sophisticated, U-shaped settee, or relax and socialize on the sofa across from it. 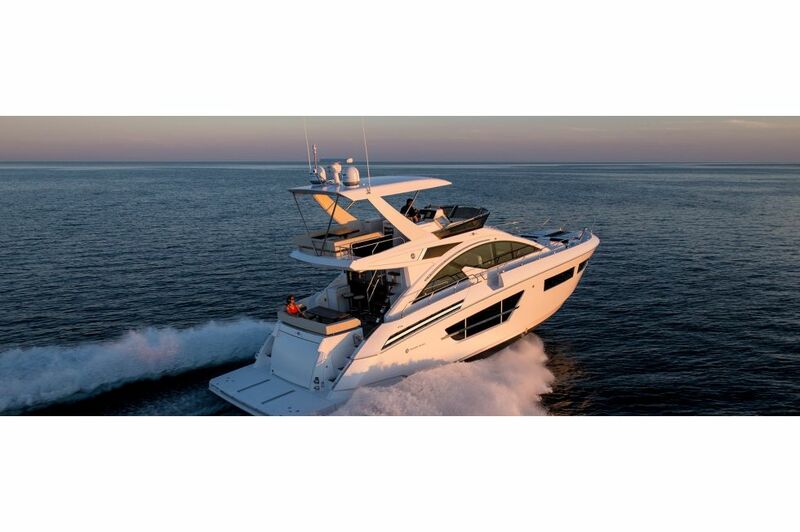 The convenient, well-equipped aft galley allows you to easily serve both the cockpit and salon. Rejuvenate after a long day in your own private oasis. 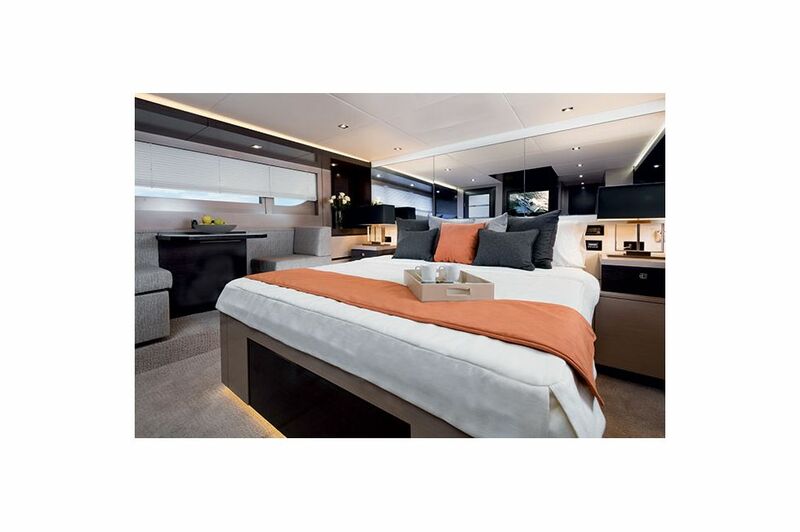 The master stateroom features a plush king-size bed for the ultimate in rest on the water. Enjoy a morning coffee at the posh café table and seats with panoramic windows, and refresh yourself in the master head with double shower and his and hers wash basins. 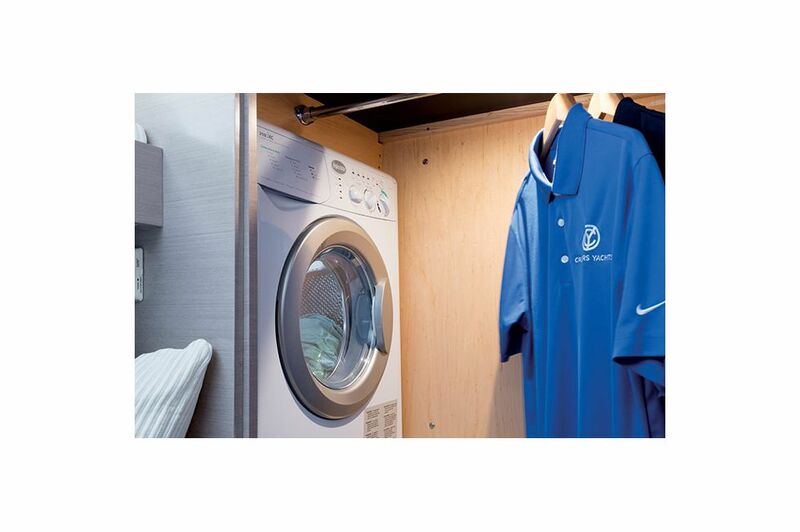 What's more, you'll enjoy plenty of storage space with the expansive master walk-in closet. 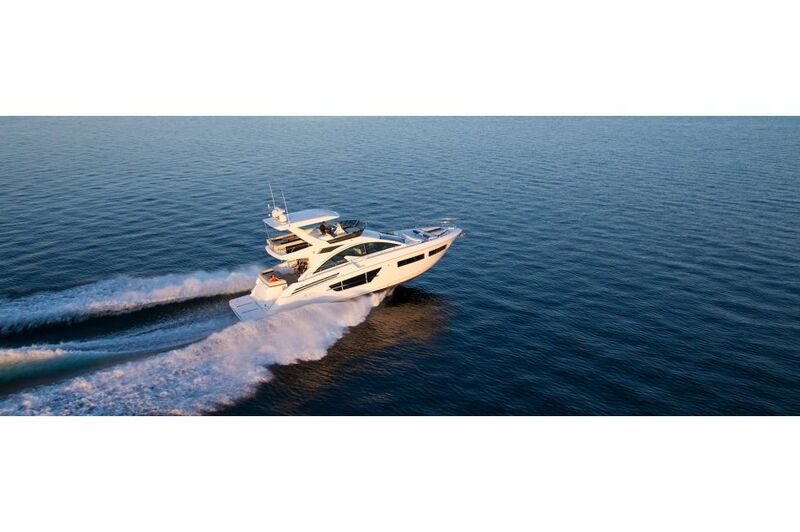 Your VIP guests deserve to retire to VIP privacy and unrivaled comfort. 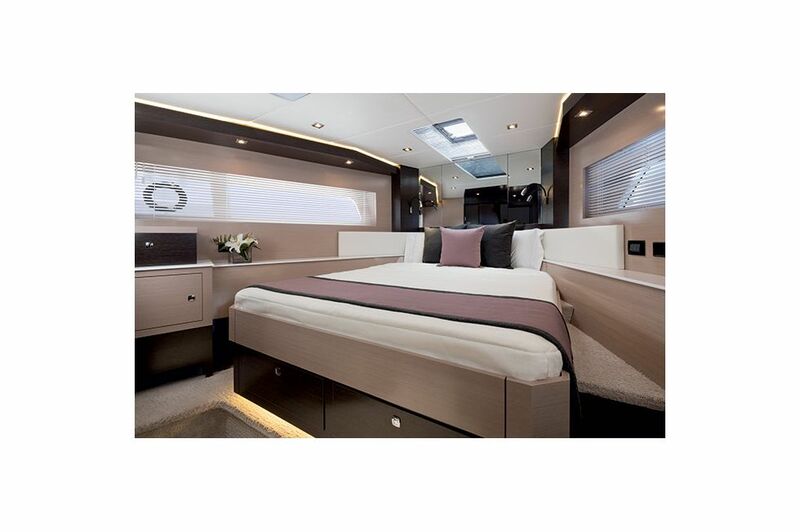 The generous queen bed, panoramic windows with gorgeous waterfront views and convenient storage options offer luxurious days and tranquil nights for anyone aboard. Visitors will love the natural light, ventilation and style of this space they can call their own, and the accompanying head offers even more privacy. Lay back and soak up the sun, delight in the breeze and take in the view. The deluxe bow lounge provides reverse crescent seating, port and starboard reclining sun lounges, and room for two side-mount tables for cocktails. 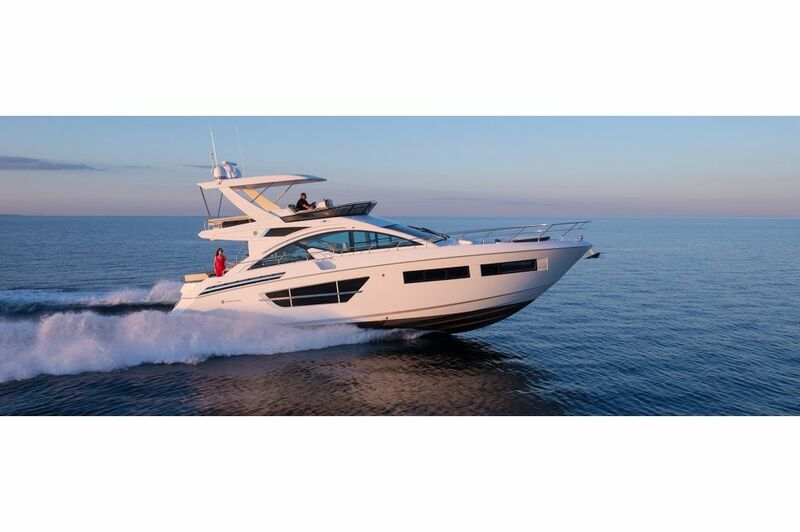 You'll find convenience around every corner aboard the 60 Fly. 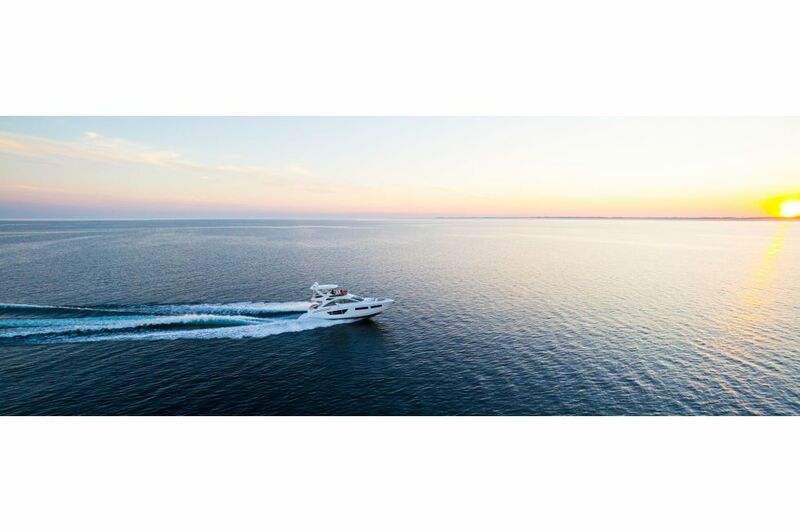 Whether you're cruising or on a long-range rendezvous, you'll always be able to keep clothing and linens fresh with the built-in, full-size washer and dryer. Additional guests aboard? No problem. 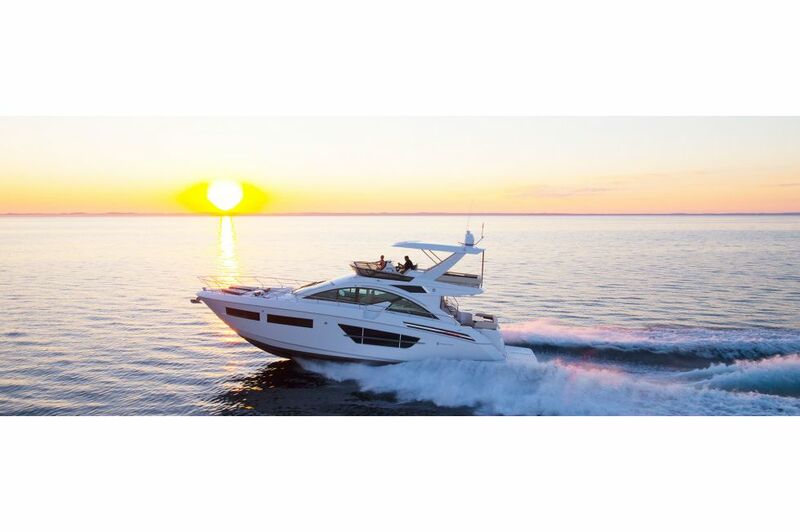 The 60 Fly offers extra features to keep all of your visitors comfortable. 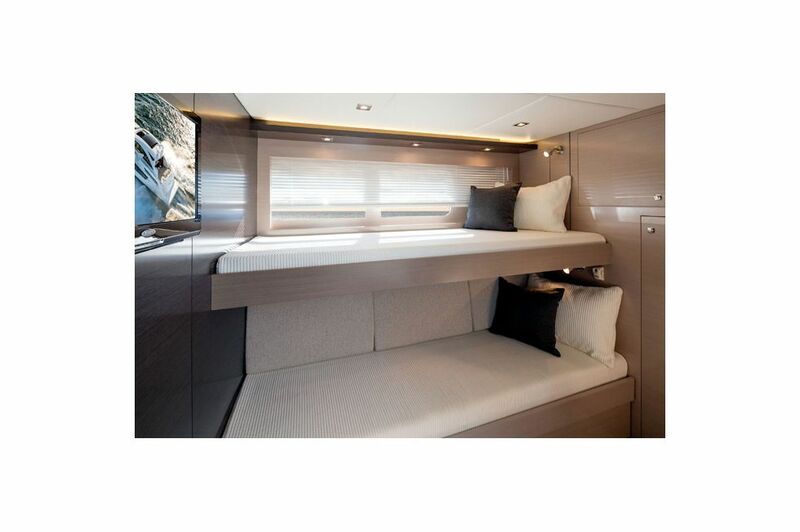 The lower salon of the 60 Fly includes a 7' long sofa which can be replaced by a third stateroom, giving you plenty of room for guests who want to extend their stay. Create meals as sophisticated as the space you're in. 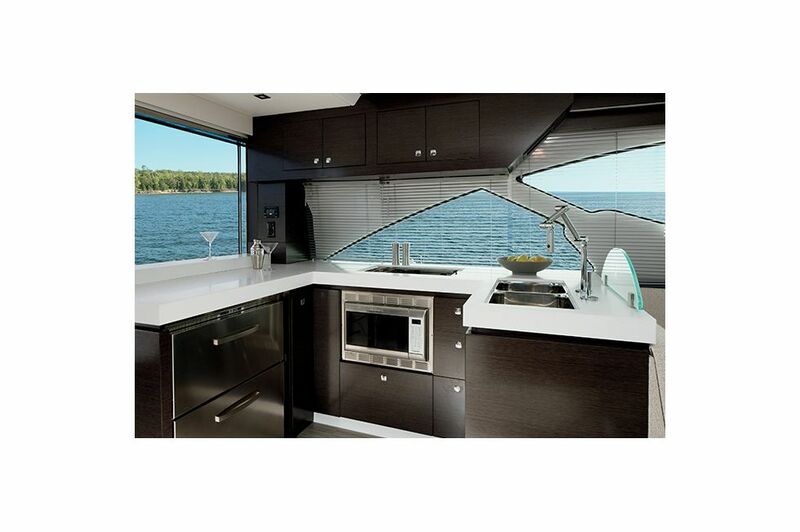 With all the amenities of home with a view that changes at your whim, the galley perfectly accommodates you and your guests. Its sharp, modern design and convenient footprint give effortless access to the microwave, dishwasher, icemaker and cooktop. 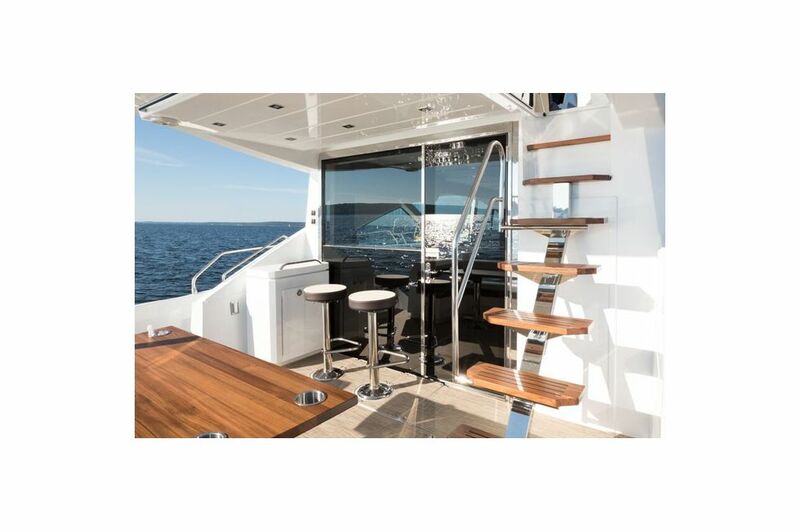 What's more, the galley is located aft to create a centralized entertaining space. The rear patio door retracts with a power-actuated window to create an ideal indoor/outdoor gathering place, featuring cozy bar stools. 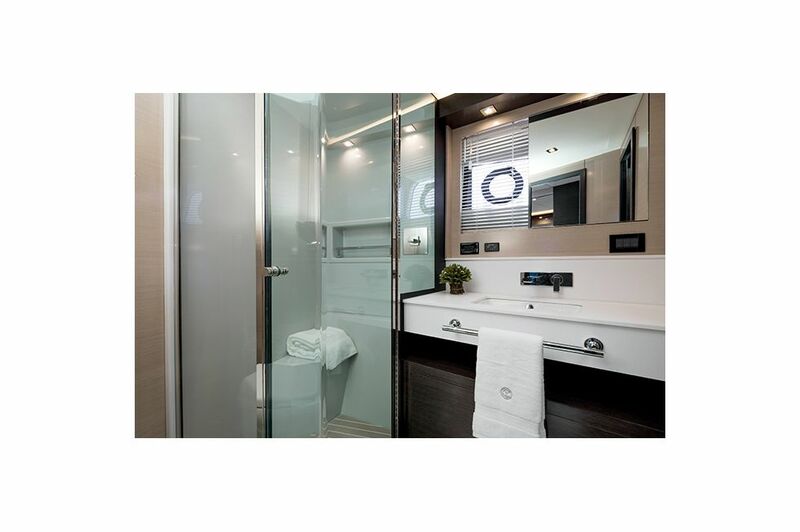 The day head features a spacious shower stall waterfall shower head and sprayer, and offers private access to the VIP Stateroom for peaceful solitude. The sleek vanity features storage underneath, is adorned with designer fixtures, and is available in your choice of black or tay oak. Refined. Refreshing. Become revitalized after a long day, or take a break from the summer sun and cool off in the spacious master head's roomy shower stall with waterfall shower head and sprayer. The stately double vanity with storage give room for two, and designer fixtures accent the space. 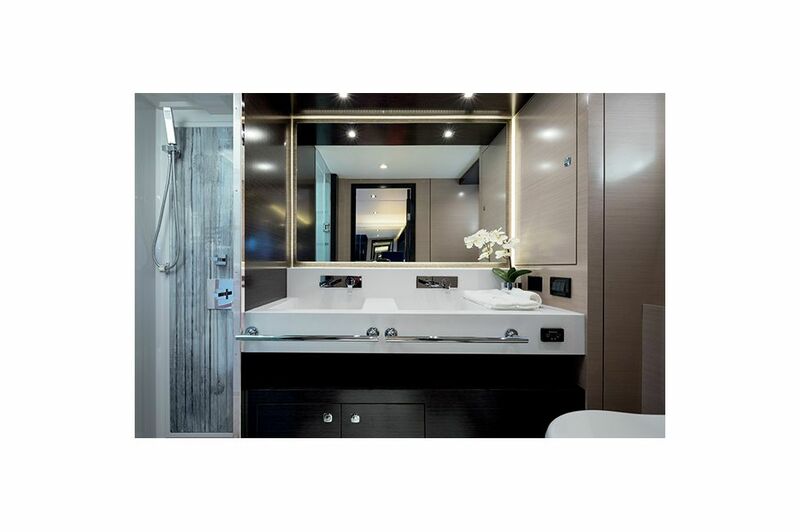 Vanity is available in your choice of black or tay oak. 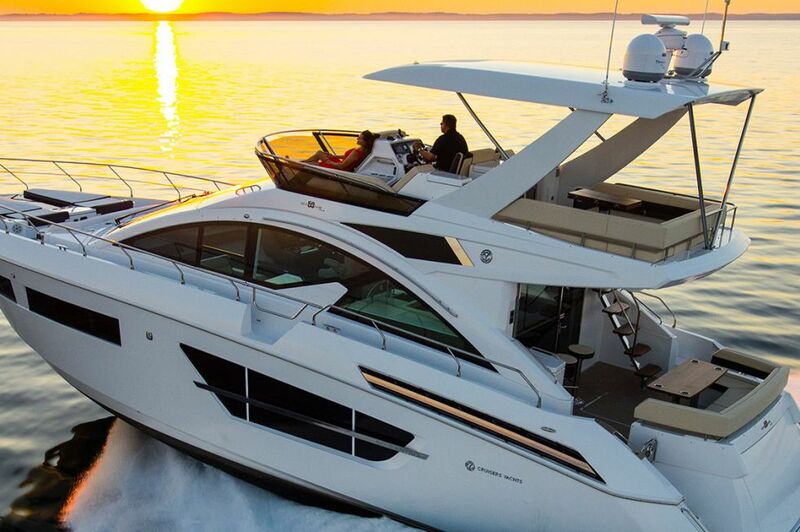 Tell your guests to pull up to the party, or board your roundabout to tour the marina with efficient rear docking from the swim platform. 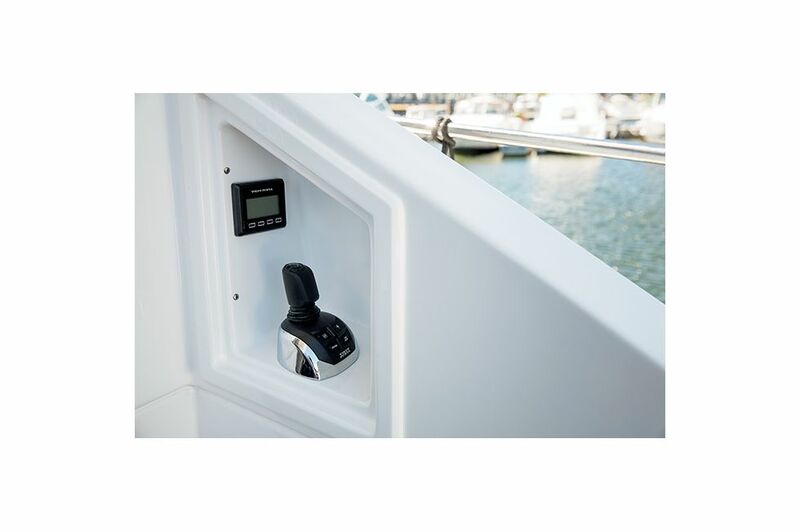 Transom storage allows you to store ropes, lifejackets and anything else needed to streamline the docking. Treat guests to home-cooked happiness with a view that stretches to the horizon. 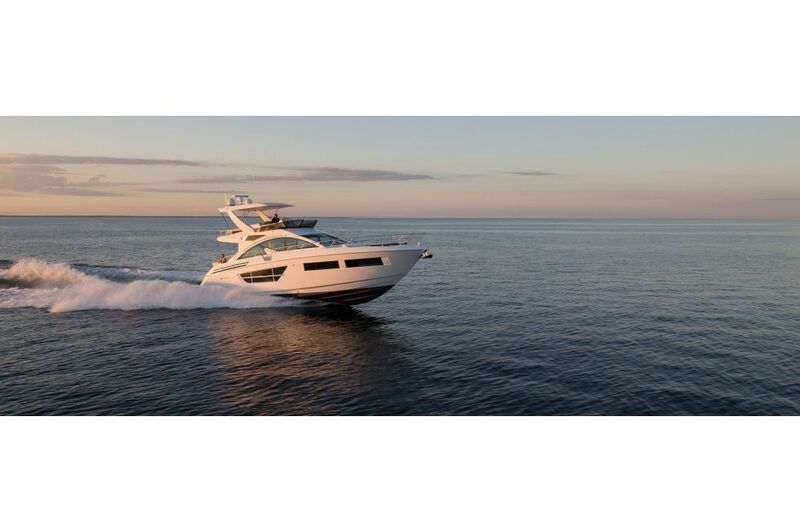 Both the main deck and flybridge boast electric grills, providing you multiple options to barbecue in paradise. Conveniently store tools and supplies underneath to shield them from the elements. Keep your refreshments perfectly chilled and at the ready. The wine captain holds up to 17 bottles of wine or champagne to ensure you and your guests are always well served. What's more, nearby cabinets provide convenient storage for your stemware. Cabinetry is available in your choice of black or tay oak.